Jake and I are back on the rock of St. Thomas and settling back into our routine and normal life here. We've gone grocery shopping, unpacked, and gotten out of vacation mode. I wanted to share some pictures and some of highlights to our trip that I haven't blogged about yet. It was a highlight to see my brother, sister-in-law and niece while we were in Maryland. We haven't seen them since our wedding so it was great to visit for a bit and see their cute faces. (I have a couple cute pictures of my niece, but due to the fact that this is a public blog I didn't post any). Thanks for letting us visit Ryan and Julia! 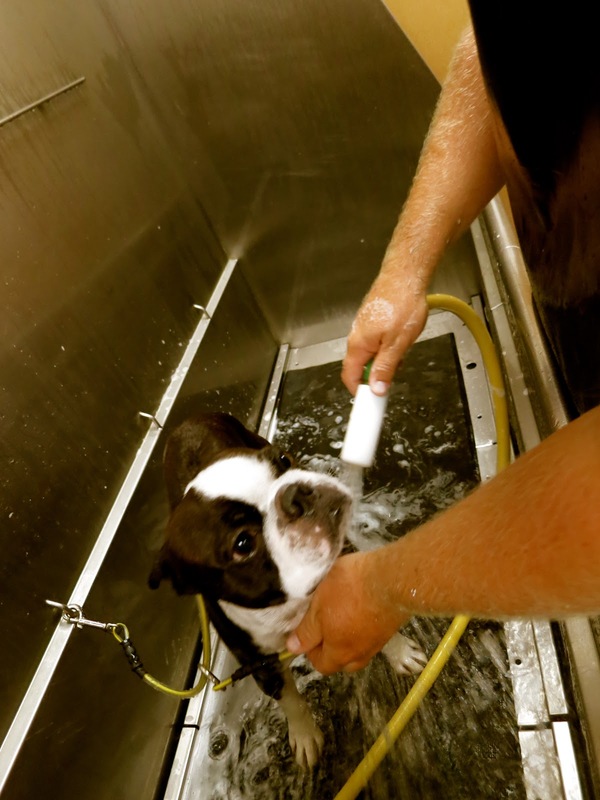 Dozer got a lot of play time at the dog park while I was in sailing lessons for 3 days. Afterwards he was smelly and quite dirty, even though we love him smelly or not he needed a bath. 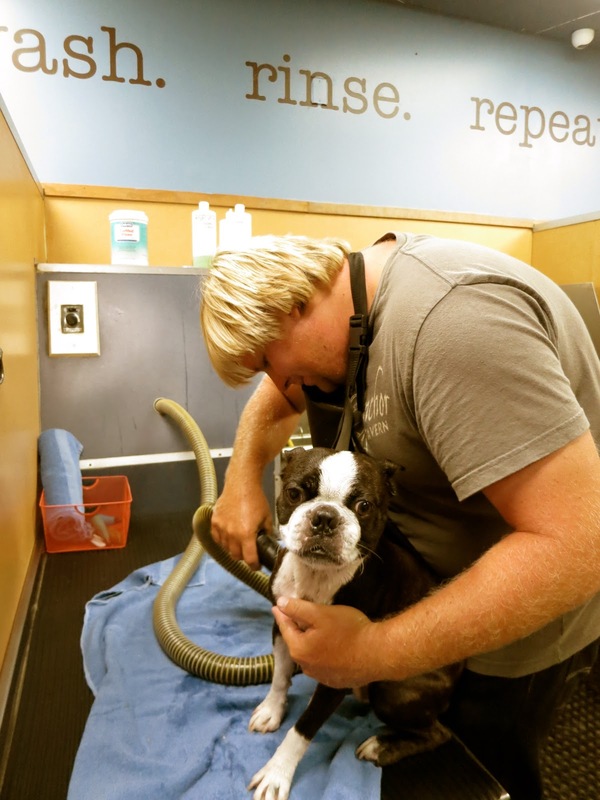 We found this fun place called Muddy Paws where you can pay a small fee and wash your dog. Here are some pictures of Jake washing and blow drying Dozer. On our way up to PA we stopped in Baltimore to meet up with some friends who we met in St. Thomas and who now live in Maryland. It was fun to see Jeff and Heather as well as visit the city where Jake and I had our first dates. We love Baltimore! This city is absolutely beautiful. This picture didn't come out as well as I would have hoped, but here we are meeting up with old friends. 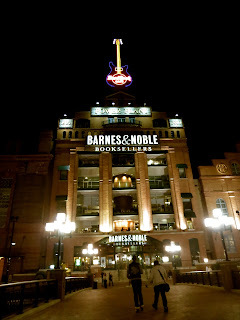 I was in heaven being able to visit a bookstore. The reason for our visit to Pennsylvania was to see Grandma and Grandpa O'Boyle. It was so nice to visit and spend a few days with them. Every moment made me miss my grandparents that have passed and my grandma in Hawaii. I am thankful for them being part of my new family. During our visit Grandpa took me on driving tours of the town he used to be Mayor of and showed me his childhood town. It was wonderful to see Pennsylvania through their eyes and hear fun stories about Jake's visits there growing up. Visiting during Fall was a highlight! I love seeing the leaves changing and the crisp air. I did complain a bit about how cold I was, but it was refreshing to see a season change.